Koji Kondo and his peers at Nintendo have crafted some of the most beautiful pieces of music in video game history, and it’s no wonder so many fans have come together to see these pieces of music beautifully arranged into a full symphonic suite. This music of Zelda resonates in ways few other videos games could ever dream of doing, which is why I was so excited to see the Symphony of the Goddesses. Unfortunately, I left the music hall feeling rather underwhelmed. This was the second time I saw the Symphony of the Goddesses performance. The first time was a few years ago, during the “Second Quest” of the show. The Dallas Symphony Orchestra was performing it at an outdoor venue, and it was absolutely incredible. You could feel the passion behind the project as the orchestra was playing and the crowd was cheering. Jeron Moore (the show’s original Producer and Creative Director) was even at the show, and he took the stage to talk about his love for the franchise, and the time and effort he and his team put into crafting that night’s show. It was a once-in-a-lifetime experience, and it’s one that I won’t soon forget — and that makes this third tour (dubbed “Master Quest”) so disappointing. For those who may not know, Jeron Moore is no longer involved with Symphony of the Goddesses — the title of which he and Chad Seiter (former Music Director) came up with when they were first envisioning the show. They worked tirelessly to create an authentically Nintendo experience and deliver a phenomenal show that would speak to both fans of the series and fans of classical music. But, for whatever reason, they are no longer involved — odd, considering it was clearly their labor of love. The end result is a hollow shell of what Symphony of the Goddesses once was. Which brings me to my lackluster experience seeing the show in Dallas. The Music Hall at Fair Park was PACKED! 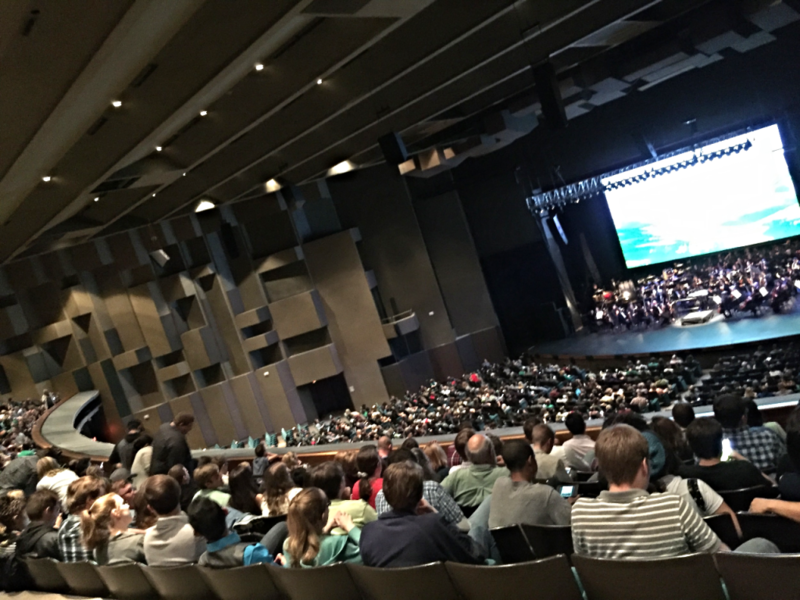 This show — performed indoors by the Dallas Pops Orchestra — left so much to be desired. I tried my best not to compare it to my former experience, but as the orchestra went down the program, I couldn’t help but think how much the show has changed for the worse. To start things off, the orchestra opened with the wrong piece of music. A new intro was composed to include a segment from the new Zelda game, Tri-Force Heroes, but the orchestra played the old intro, resulting in a music video that played out of sequence with the music (the entire concert features scenes from the various Zelda games on a giant screen). After the piece was finished, Jason Michael Paul took to the stage and he jokingly bashed the orchestra for playing the wrong piece of music, then made them restart the concert with the right piece of music (because his “perfectionism” wouldn’t allow him to just ignore it). I don’t mind so much that he wanted the right piece of music to be played — I would probably be upset if I were in his shoes, and Nintendo probably requires him to feature the new music from the new Zelda game — but he came across like an entitled douchebag who was upset that things didn’t go 100% according to plan. He lacked the professionalism and passion Jeron brought to the stage, which set the tone for the entirety of the show. I don’t know if it was JMP’s mandate to restart the concert, or if the Dallas Pops didn’t get the proper time to rehearse, but most of the pieces they performed felt highly unpolished. Most of the time the choir was too quiet, or the brass section was too loud, and the percussionists were off-tempo on at least two separate occasions — and when the camera zoomed in on the players, many of them looked super bored as they were playing and/or waiting to play their parts. There was no attentiveness, no enthusiasm, no focus. At times it even felt that the conductor (Amy Anderson) was having to pull the music out of them as she was conducting, which was quite distracting. Thankfully, the orchestra seemed to rebound after the intermission — which leads me to believe they didn’t warm up before the show, turning the first half into a live rehearsal session — and they finished the second half of the show with jubilant vibrancy (the A Link to the Past symphonic movement was particularly impressive, and it was easily the standout of the show for me). Overall, it was an enjoyable, but disappointingly unrefined performance by the Dallas Pops. One of the worst parts of the whole experience, though, was the production itself. I don’t know how much control JMP has over the show — or if he even cares enough about it to think about these things — but the sequence of the pieces performed felt stilted at best. If you think this rundown is all over the place, you are not alone. The concert was annoyingly disjointed at times, especially with the triple encore. Most of the audience was losing their minds over the three extra songs, but I (and the gentleman sitting behind me) found it to be distracting and pulled me out of the concert experience. It became a frenzy, and it took away a lot of the charm of the finale three pieces (which were actually performed quite well). Basically, I would have combined the two Majora’s Mask pieces (which were both roughly 5 minutes) into a single movement. It just makes the most sense, especially because the Ocarina of Time movement naturally progressed into Majora’s Mask (this would also eliminate the excessive triple encore). However, I don’t know how familiar the new music director (if there even is one) is with the material, or how capable they are, because the new arrangements are just… lacking. The new Intro featuring Tri-Force Heroes was a random arrangement of Zelda music with no sense of direction or thematic continuity, but the Link Between Worlds piece was the worst of the lot. 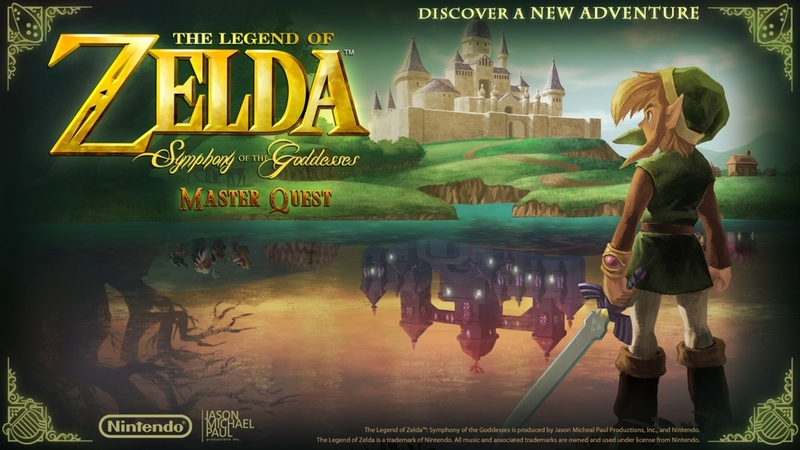 Instead of drawing on the vast number of musical themes from that game, the medley was only four minutes long and featured two songs — the Hyrule Castle theme, which was a basic rearrangement of A Link to the Past’s, and the main theme for the game (which is Hyrule Castle in reverse). They could have done so much more with this medley, especially because that game has some of the best music in the Zelda series, but they opted for the easiest way out, which speaks volumes about the new direction for this production. The biggest offense, though, was the Twilight Princess symphonic movement. The video accompanying the piece was completely redone, featuring scenes from the game that had nothing to do with the music being played. I don’t know who pulled the trigger on that, but I know Jeron edited a lot of the videos when he was involved with the show, so this felt like a particularly firm slap to the face to him, and to the fans who recognized the glaring inaccuracies on display (for those who are familiar, they played Dark Beast Ganon’s musical segment to images of Zant taking over Hyrule Castle, they played the hopeful ending music while Hyrule was being covered in Twilight, and they completely removed Midna’s departure from the video, completely undercutting the emotional intensity of the music and the game’s brilliant ending). At the end of the day, I don’t regret seeing the Master Quest run of Symphony of the Goddesses, but this new production pales in comparison to Jeron and Chad’s show. It’s clear that Jason Michael Paul doesn’t appreciate the Zelda franchise or its music, nor does he understand the intent behind the careful construction of the original show. For instance, he removed songs such as the Link’s Awakening Medley, and the Songs of the Hero piece (which were both carefully placed to tell a grander Zelda narrative) and replaced them with subpar pieces of music. It’s an unfortunate turn of events, because this show used to be something special. Now it feels like a cheap cash grab that preys on nostalgia, rather than celebrating the passion of Zelda fans — and that is the most disappointing thing of all.